Part of the Dallas beltway system, Interstate 635 (Lyndon B. Johnson Freeway) wraps around the northern and eastern side of the city. Known simply as the LBJ Freeway, IH 635 begins at Interstate 20 in Balch Springs and leads in a counterclockwise direction through Mesquite to Garland, Farmers Branch and IH 35E (Stemmons Freeway). Beyond IH 35E, IH 635 spurs 8.50 miles west through Farmers Branch, Irving and along the Coppell city line to SH 121 in the city of Grapevine. SH 121 links IH 635 with International Parkway south through Dallas-Fort Worth International Airport (DFW) and north to Lewisville. The LBJ Express project upgraded IH 635 between the Central Expressway (US 75) and Interstate 35E, with the addition of two or three tolled lanes per direction. Formally named the LBJ Express or LBJ TEXpress, the new lanes utilize variable tolling where rates increase during periods of traffic congestion along the main lanes of IH 635. The I-635 East HOV/Express Lanes were converted from high occupancy vehicle lanes to high occupancy toll (HO/T) lanes on October 1, 2016.4 Operated by the Texas Department of Transportation (TxDOT), the express lanes allow non HOV traffic to use the lanes at a variable toll rate. Construction scheduled to start in late 2020 will rebuild the HOV/Express Lanes into the I-635 East TEXpress Lanes. The northwestern segment of Interstate 635 was constructed in 1981-82. This extension was conditionally approved by AASHTO on November 16, 1974. Interstate 635 completed to southeast Dallas – 1971 Texas Official Highway Map. 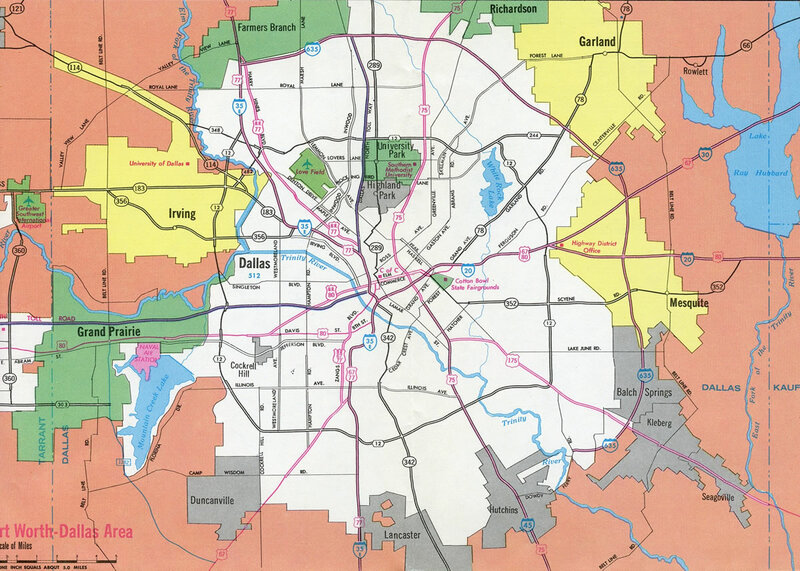 The 1973 Texas Official Highway Map shows IH 20 and 635 cosigned west from Balch Springs to IH 35E in south Dallas. Slip ramps join the LBJ Express lanes with the I-635 Service Roads ahead of SH 289 (Preston Road). Photo taken by Justin Cozart (09/11/15). The LBJ Express Lanes travel below grade between Webb Chapel Road and the Dallas North Tollway and from the Dallas North Tollway to Hillcrest Road. Interstate 635 straddles the Irving and Coppell city line northwest to the diamond interchange (Exit 35) with Royal Lane preceding SH 121. Photo taken by Matt Tharp (10/09/16). Crossing over Royal Lane, IH 635 advances west to the Tarrant County and Grapevine city line at the split of Exit 36 for SH 121. Photo taken by Matt Tharp (10/09/16). Exit 36A separates into ramps for SH 114/121 south to Southlake and Fort Worth, SH 114 east to Irving and International Parkway south to Dallas Fort Worth International Airport (DFW). Photo taken by Matt Tharp (10/09/16). Exit 36B partitions with a ramp to Bethel Road east and Bass Pro Drive. A distributor roadway continues northward to FM 2499 (Grapevine Mills Parkway) for Flower Mound and SH 121 northeast to Lewisville. Photo taken by Matt Tharp (10/09/16). This end shield preceded the Seagoville Road off-ramp at Exit 1A. It was replaced with a southbound confirminng marker by 2011. Photo taken by Chris Patriarca (06/20/03). A directional ramp (Exit 1C) leads east from IH 635 southbound onto IH 20 at Seagoville Road. Sign changes made here dropped Tyler for Interstate 20. Photo taken by Chris Patriarca (06/20/03). Guide signs at the south end of IH 635 was replaced by 2007 to use Clearview font. Interstate 20 vacates the Dallas area en route to Terrell in 20 miles. Photo taken by Chris Patriarca (06/20/03). Milepost zero is located just beyond the Seagoville Road underpass. The systems interchange joining IH 20 with U.S. 175 (C.F. Hawn Freeway) lies just to the southwest. Photo taken by Chris Patriarca (06/20/03). One mile ahead of IH 635 (Exit 480) on IH 20 west at the Seagoville Road underpass. Hazardous cargo based transport is permitted on both IH 20 and IH 635 around the city of Dallas. The two freeways stay 12 to 14 miles out from the city center. Photo taken by Chris Patriarca (06/20/03). The entrance ramp from Seagoville Road adds a short auxiliary lane for Exit 480A (Kleberg Road) just ahead of the directional T interchange (Exit 480B) with the LBJ Freeway north. Photo taken by Chris Patriarca (06/20/03). Interstate 635 arcs northwest toward Richardson and Farmers Branch. IH 20 runs across south Dallas between Hutchins and Duncanville. The Dallas city center lies 13 miles to the northwest. Downtown Fort Worth is 46 miles to the west. Photo taken by Chris Patriarca (06/20/03). IH 20 turns northeast through the multi level interchange with U.S. 175 (C.F. 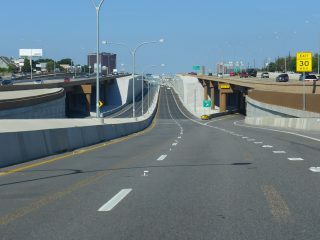 Hawn Freeway) to the immediate south of IH 635 (Lyndon B. Johnson Freeway). U.S. 175 originates in Dallas and travels east to Seagoville, Crandfall and Kaufman. Photo taken by Chris Patriarca (06/20/03). Guide signs for IH 635 originally used no control cities. When IH 20 was completed across south Dallas and IH 635 was truncated east to Balch Springs, Mesquite was added for the LBJ Freeway at Exit 480. Garland was added to signs by 2000. Photo taken by Chris Patriarca (06/20/03). The flyover from U.S. 175 (Hawn Freeway) east partitions into ramps for IH 635 north and IH 20 east adjacent to the Interstate 20 mainline. Sign changes made by the early to mid 1990s added Tyler in addition to Shreveport, Louisiana for IH 20 east. Photo taken by Jeff Royston (08/19/02). Entering the directional T interchange (Exit 480) with IH 635 north on IH 20 in Balch Springs. IH 20 travels through southern reaches of Mesquite to Terrell. The LBJ Freeway branches north to central Mesquite and IH 30. Photo taken by Chris Patriarca (06/20/03). A begin sign for IH 635 appears along the connection from IH 20 east to the LBJ Freeway north beyond the gore point (Exit 1A) for Seagoville Road. Photo taken by Jeff Royston (08/19/02). “Editorial: Zippier, glitzier version of LBJ needs its own instruction manual.” The Dallas Morning News, September 9, 2015. “1st step for LBJ project.” The Dallas Morning News (TX), September 12, 2003. Chapter 6 Excerpt: Interstate 635 LBJ Freeway, Dallas-Fort Worth Freeways, 2014 ebook. I-635 East TEXpress Lanes Project Fact Sheet. Texas Department of Transportation (TxDOT). Page updated February 25, 2019.